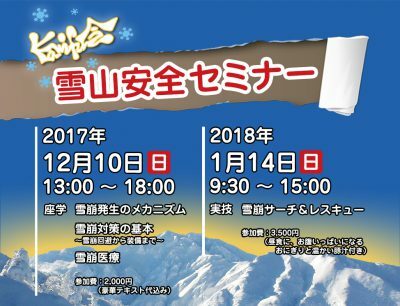 It’s that time of the season again, the 2017/2018 season Kamifukai Avalanche Seminar date has been decided, and the doors are opens to application. Read this article thoroughly including precautions before proceeding to the application process. *Please note that all classes are available in JAPANESE ONLY. Japanese communication skills are prerequisite at this time. Deepen your understanding of avalanches and other important safety issues through lectures and course manual. Let’s put what you learned in the lectures into practice in the mountain snow. 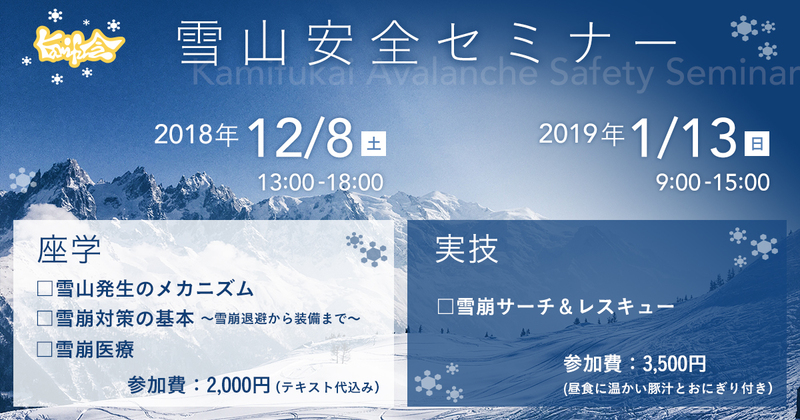 Please note that only those who have taken avalanche seminars or lectures held by Kamifukai or other similar organizations in the past are qualified to take this training. If you are uncertain, please contact us and provide the type of training you have previously received. Please use the application form on this website for entry. Inquiries by phone are not accepted. Use a valid email address per each applicant, and if using a Japanese mobile carrier address, be sure that it can accept emails from the @kamifukai.jp domain. Do not use an email address for multiple applicants. Use separate email dedicated for each applicant. First of all, why do avalanches occur? Let us learn different factors and conditions of avalanche including climate, temperature etc. to understand the mechanism of avalanche occurrences and basics to judge risks. During winter season in Kamifu area, death from avalanches have been higher than any other distress factors for backcountry skiers, resulting in numerous disasters in the past. This lecture provides people who are inexperienced in winter mountains information regarding avalanches, including hazard assessments, risk management and necessary equipment to avoid troubles with visual materials to help them understand easily. Dr. Ou Oikawa, who actively took part in the 56th Japanese Antarctic Research Expedition, is a faculty member of Asahikawa Medical University. He will speak about medical care issues in unusual circumstances including winter mountains and avalanche occurrences, which are totally different from normal urban areas. Payment: Please pay in cash upon arrival. Sign up for the seminar from here. *Be sure to arrive by 8:30 as we are planning to set off to the training field at 9:00. Payment: Please transfer the tuition prior the training. *The transfer information will be sent via email. *Please note that mountain climbing is not included in the curriculum, but the training is planned to be held in a remote area with deep snow. *Please email（contact@kamifukai.jp） us if you have any further inquiries regarding your personal belongings. 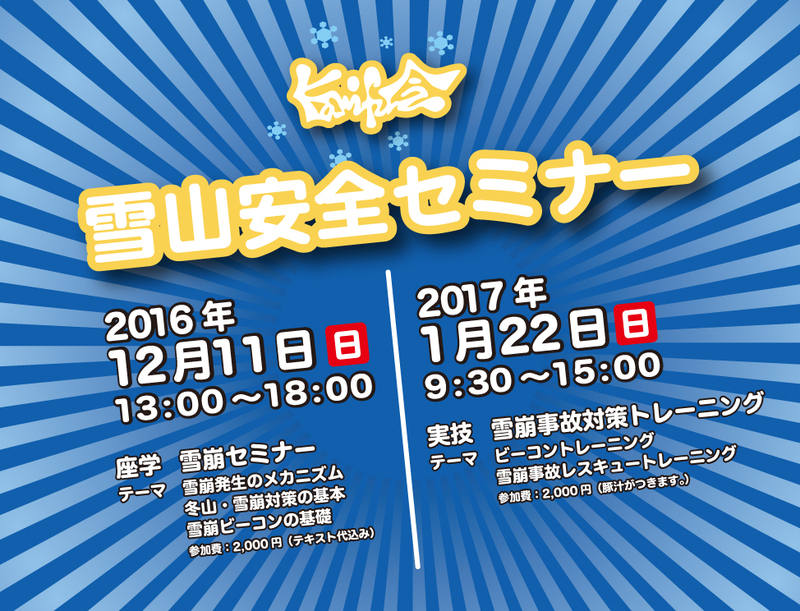 It’s that time of season again, the 2016/2017 season Kamifukai Avalanche Safety Seminar dates have been decided, and doors are open to applications! Please note, however, that this course is only available in Japanese, and we unfortunately cannot accommodate students that cannot communicate with at least somewhat fluent Japanese skills. 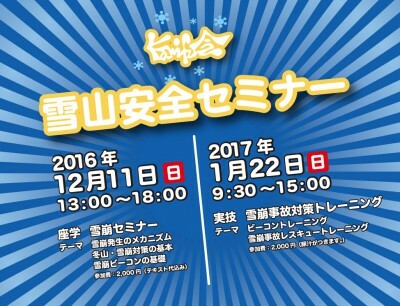 When: 13:00-18:00, 2015 Dec. 11th. Application: Fill out the form at the end of this page, or send an email with your details to contact@kamifukai.jp. Make sure your emailer is setup to receive mail from “@kamifukai.jp”. If you haven’t received an auto-response within a few minutes of sending the form, chances are it ended up in your Spam folder. *Includes are warm “Tonjiru” Japanese lunch. Be sure to bring: Avalanche transceiver/beacon, probe, shovel, and snow walking gear (snow shoes preferred, skinned up skis/splitboards would suffice as well) as well as full winter mountain gear to keep you warm for a full day of outdoor activity in extreme cold weather. Also note that beginning this year, WE REQUIRE that you have a 2 antennae digital beacon or better. We no longer offer attendance to users of Analog and 1 Antennae Digital (aka Pieps Freeride) users, due to this technology being obsolete. If you have any questions over what you may need, send an email to contact@kamifukai.jp.